Sicario is the type of action thriller that leans towards the adult audience more so than the blockbusters. It’s a moody mix of suspense peppered with action and compelling characters. Denis Villeneuve’s is beautifully shot film that never shies away from the ugly side of violence and vengeance. Still it’s not nearly as bleak as his previous film Prisoners which seemed intent on showing the closing darkness. That’s not to say that this film is a bright and uplifting sing along, far from it. Its characters are various shades of gray. Emily Blunt’s performance here shores up her transformation from rom-com to ruthless but with a touch of subtle vulnerability. The supporting cast is headline by Josh Brolin who is having a good time playing a CIA spook that is out for his own interest but Benicio Del Toro is the star of the show. Del Toro is a fascinating mix of cool and dangerous throughout. His character doesn’t say much but the performance lets you know there’s plenty going on behind those eyes. It’s an intriguing drug war drama throughout Villeneuve’s most accessible film yet. Can't argue with your review. 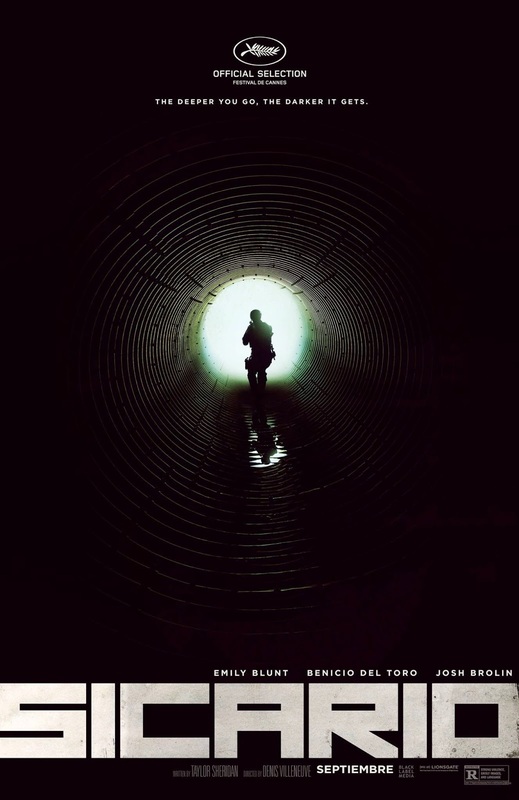 Almost everything about Sicario was freaking awesome! She's a great actress, really like the path her career is taking thus far.